They may go by many names, but whether you call them Weihnachtskaktus (German), Cactus de Noël (French), Cacto de Navidad (Spanish), Thanksgiving Cactus (American), Holiday Cactus (US) or even Crab Cactus (referring to the clawed ends of the stem), you can’t go to any garden center or grocery store this time of year without being tempted to buy a Christmas Cactus (Europe/US/Canada). But just how do you keep them healthy—and, as importantly, get them to bloom again next year. Like poinsettias, another holiday flower, there’s a trick to that. According to Clemson Cooperative Extension, Thanksgiving cactus (Schlumbergera truncata) and Christmas cactus (Schlumbergera bridgesii) are popular, fall- and winter-flowering houseplants native to Brazil, where they grow as epiphytes on tree branches in shady rain forests. Their flowers are available in a wide variety of colors including red, rose, purple, lavender, peach, orange, cream, and white. Strangely enough, what we call “Christmas cactus” and find most often in stores starting around November is most likely the Thanksgiving cactus (Schlumbergera truncata), as it blooms almost a month before Schlumbergera bridgesii. If you really want to impress your friends with your horticultural knowledge, the way to tell the two apart, according to the Clemson website, is to “look at the shape of the flattened stem segments, which are botanically called phylloclades. On the Thanksgiving cactus, these stem segments each have 2 to 4 saw-toothed serrations or projections along the margins. The stem margins on the Christmas cactus are more rounded. Since Holiday cactus originated in shady rain forests, it is best to grow them in light shade. The secret to good repeat flower production involves temperature regulation (do not let the temperature go over 90 degrees once the flower buds appear) and photoperiod (length of day and night) control. Fourteen hours or more of continuous darkness each day for at least six weeks is required for complete bud set to occur. Street lights, car lights or indoor lightening can disrupt the required dark period. My mother, who once grew a Christmas cactus so large and with so many buds that she donated it to a horticultural center when she moved, would put her Christmas cactus in a dark closet every night for six weeks starting in September. Watering and fertilizing the Christmas cactus is fairly easy. 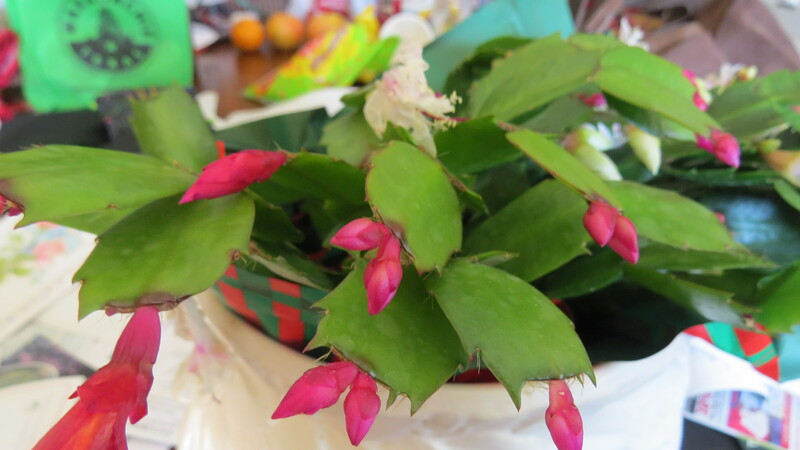 Though Holiday cactus can tolerate being somewhat under-watered during the summer, once buds appear the soil should remain slightly moist or the buds may drop. Clemson recommends fertilizing once monthly with a dilute 20-20-20 fertilizer from the time new growth starts in the early spring. As Holiday cactus have a higher requirement for magnesium, Epsom salts (one teaspoon per gallon of water) can be used also, but not applied at the same time as the other fertilizer. The plants do best grown in well-drained soil and like being somewhat pot bound. The most common problem is over-watering which produces root rot. Christmas cactus is easily propagated by cuttings, so if you are looking for a present to give to your gardening friends, you might try growing them yourself. However, whether you want to go to all the trouble of getting them to bloom or whether you just want to consider your Christmas cactus as a “holiday annual plant,” go ahead and purchase that beautiful Christmas cactus at the store. After all, what says “Holiday” to a gardener more than poinsettias and Christmas cactus. Posted in Winter and tagged Christmas Cactus, Holiday Cactus, Thanksgiving Cactus. Bookmark the permalink. And Merry Christmas to you! thanks for writing such a cute note to us! Here’s to good gardening in 2015!